Hi there and happy Sunday! 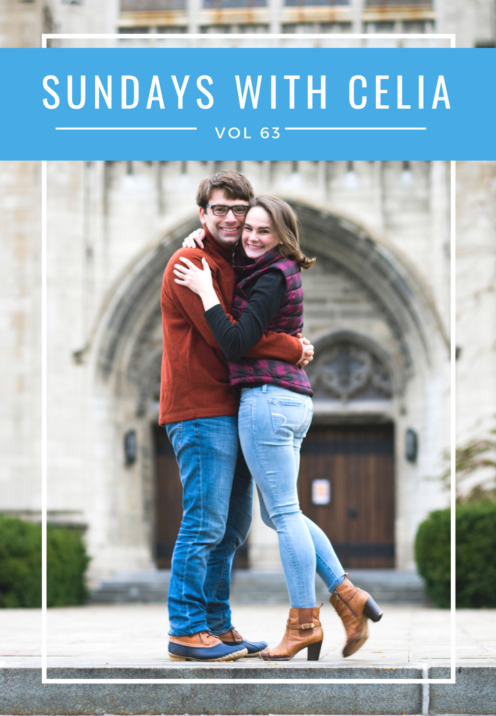 I’m so pleased you’ve joined me here for Sundays With Celia Vol 63. It’s been the usual busy week around here. I met with our “month of” Wedding Coordinator to go over all the fine details of the big day. That meeting forced me to be even more organized and prepared as my son’s wedding day approaches, which is just, yikes, 5 weeks away! This week Brad and I also attended a birthday party for our Hollywood friend WK, who we affectionately call “Dub”. These days he’s a sound guy on The Walking Dead and Fear the Walking Dead, among other popular TV shows. My witty husband started calling him Fear The Walking “Dub” for fun, so we decided to play that up for his birthday. 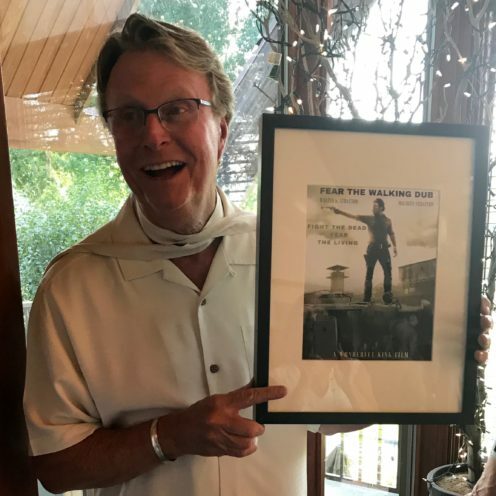 We purchased him the domaine name, and I made and framed a mock movie poster for him. Dub was very pleased with his present. And we went to a blast-from-the-past Gino Vannelli Concert at The Rose in Pasadena on Friday night. The 70’s crooner still has his pipes and charmed a packed house with his Grammy nominated hit, I Just Wanna Stop, among other popular songs. 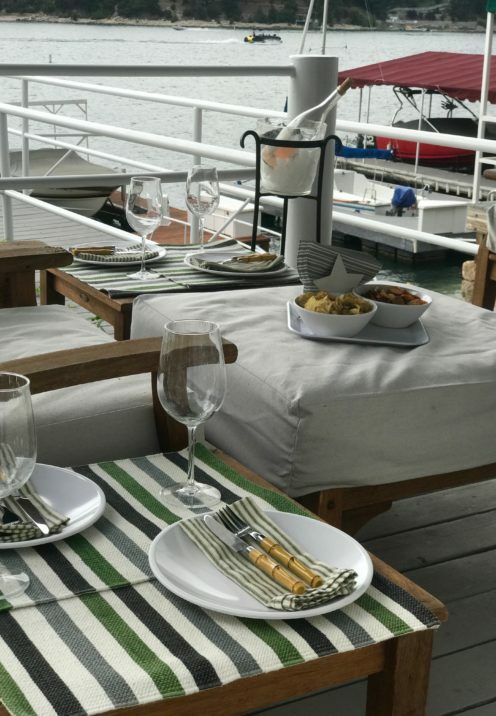 This week on the blog I took you with me for a little Dinner On The Dock At Sunset with my DC dwelling son & grand-babies. 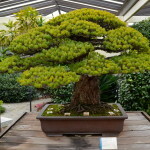 Use the link to view the post if you missed it. 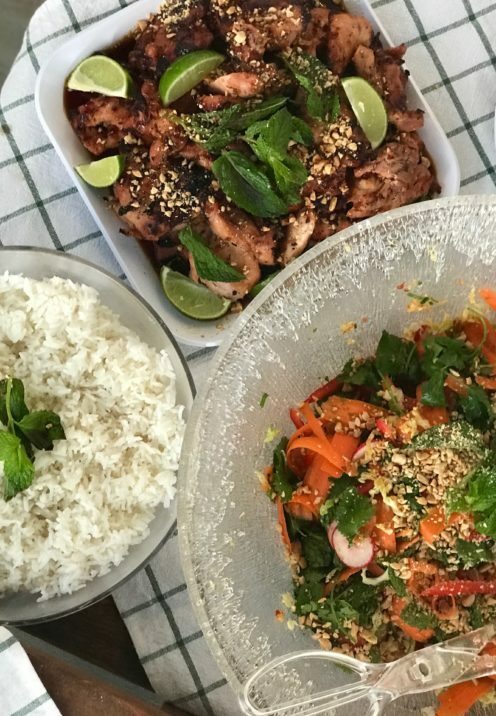 And in a subsequent post we dined at the dock yet again and I shared with you all the yummy recipes for our Vietnamese BBQ. 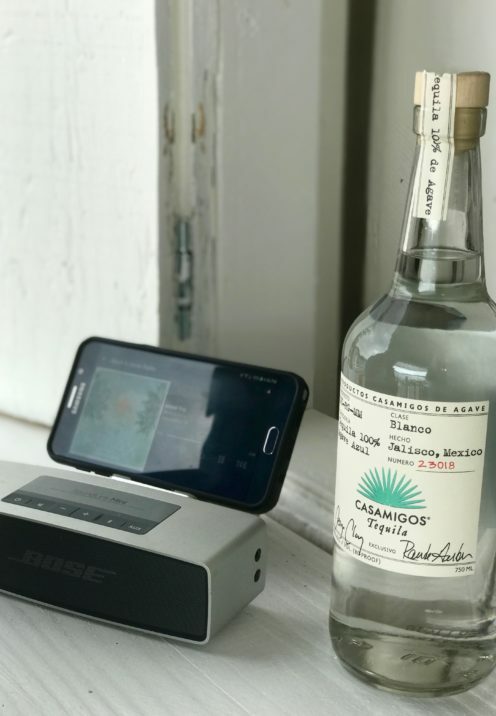 Have you tasted the popular tequila brand Casamigos? 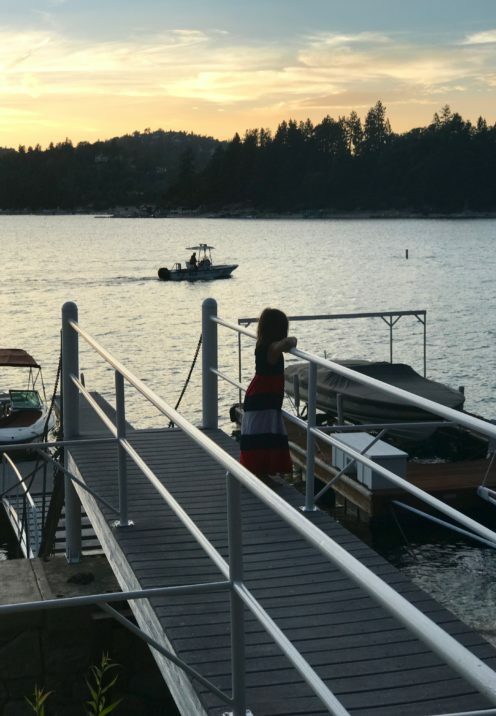 Turns out there’s nothing like smooth jazz and smooth tequila on a warm summers night on Lake Arrowhead. My husband recently brought a bottle down to the dock to enjoy with his friends. I’m a little late to this party but it seems George Clooney and his 2 partners recently sold their premium tequila brand Casamigos to a British beverage company for a whopping price of $1 billion! That is an incredible windfall for a product that the trio formed only about four years ago! When it comes to your personality, your nation of birth may not be your true home. Would you like to know where in the world people are most like you? I gave this test a try and it had starling results. 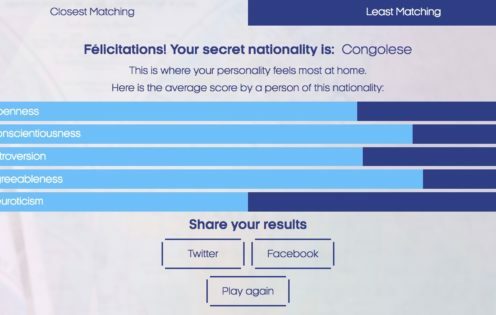 Turns out my personality is apparently most like folks from the Central African country known as the Congo! Hum.. I’ve been to a lot of places on the planet but the Congo is not one of them. Maybe I’ll have to add it to my bucket list? It also told me I am least like a person from Japan. No big surprise there. 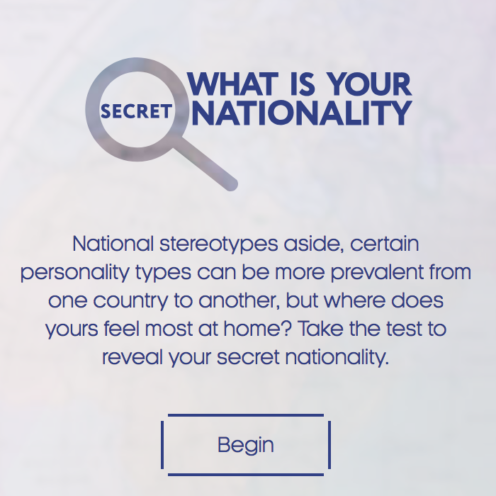 Find out your secret nationality by clicking here. As I’ve repeated on this blog many times, I have a real affection for all things British. In fact, about a year and a half ago Brad and I booked a 12 day British Isles Cruise on Oceania Cruise Lines that is circumnavigating England, Ireland and Wales as we speak. At the time of the booking we had no idea that we’d be hosting our son’s wedding 3 weeks after returning from that cruise. So, sadly we decided to reschedule the cruise for a less hectic period in our lives, and boy am I glad we did! That said, had we not cancelled I’d be coming to you today from Dublin, Ireland. But since I’m only dreaming of Britain right now I thought I’d share with you something very British: A documentary about Prince Charles’ wife, Camilla. Season 4 starts tomorrow, 9/8C on AMC and the following day on Netflix. Well, I hope you are having a really great Sunday!